After a surge in voter registration in Texas, there was strong voter turnout in North Texas Monday on the first day of early voting for the Nov. 6 election. At the Grauwyler Park Recreation Center on Harry Hines Boulevard in Dallas, the line of voters extended out the door and across the front of the building around lunch time. Several voters who had voted there in the past said it was larger turn out than they had seen on the first day of early voting before. Voter Juanita Saenz said she waited 20 minutes, using all of her lunch break, but it was worth it. The graph below compares the early voting totals by day for each of those counties and will be updated each morning with the previous day's early voting totals. “We want to make a difference. We need it. We need to make a change,” Saenz said. Dallas County voter Brandon Naylor said he had seen a large crowd once before at Grauwyler, but Monday’s start of early voting was impressive. “This is an import election. I think it’s important for Texas. So I think whatever side you are on, I think you should come out and show your support for whoever it is you want to vote for,” Naylor said. For much of the day Monday, the lobby of the George Allen Courthouse on Commerce Street was filled with voters waiting to cast early ballots. The civil courthouse is a replacement early voting location for the Dallas County Records Building, which is closed for renovation this year. “This is the lunch hour, so I guess that’s part of it. But it’s exciting to know. That’s good,” voter Curtis Hill said. He and voter Robyn Jardine decided to try the Dallas Central Library early voting location instead, hoping for a shorter wait. “This has been a big huge push for Democrats in the ‘Blue Wave’ to get everybody out early,” said Jardine. Other voters said emotions are strong on both sides of this election. At the Marsh Lane Baptist Church early voting location in North Dallas, Scott Gilmour described himself as a "Constitutional" voter. "I think it’s getting to a point where we’ve got almost a cultural war going on," Gilmour said. "One side is quite different than the other." Gilmour said he had never seen so many voters on the first day of early voting in the past at Marsh Lane Baptist Church. He planned to return later in the day when the line was smaller. Voter Francisco Castreyta agreed that things are very polarized but he said the line did not bother him. "I think it’s important. That’s why I wanted to show up a little early for early voting. I know the lines can get longer, the longer you wait, if you wait until Election Day," Castreyta said. According to county records Tuesday, 59,389 people voted in Dallas County Monday while 41,623 voted in Tarrant County, 33,350 voted in Collin County and 19,045 voted in Denton County. 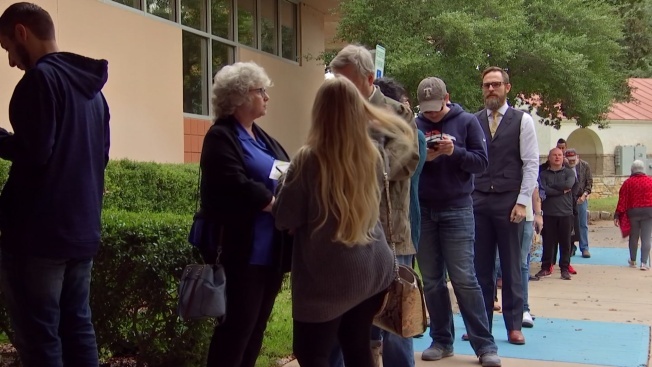 The day 1 early voting turnout is an increase of between three and five times the number of voters who showed up during the first day of early voting for the 2014 midterm election. Texas saw a surge in registration this year with a record 15.6 million people now signed up to vote. That is 1.6 million more than in 2014. Around 400,000 people were added to the Texas voter rolls since March. It compares to around 100,000 added each year in the past.